We are engaging in quality improvement and research activities to evaluate and improve outcomes of pediatric critical illness and injury in limited-resource settings. Develop research activities to characterize current prevalence and outcomes of pediatric acute illness in limited resource settings. Develop research interventions to improve outcomes in pediatric critical illness in sub-Saharan Africa. Develop pediatric severity of illness scoring systems for low-resource settings. 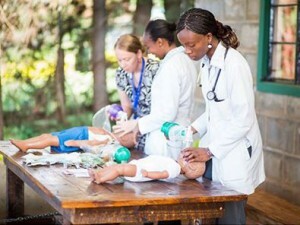 This is a recently closed prospective multi-center trial, funded by the Laerdal Foundation, and conducted in several developing countries that surveyed the prevalence, interventions, outcomes, and barriers to emergency and supportive care for children with traumatic brain injury and acute neurologic infections. Kenyatta National Hospital/ University of Nairobi served as one of the study sites managed by a PECC collaborative research team from University of Nairobi and University of Washington. The PECC team has implemented pilot studies on improved inpatient monitoring of critically-ill children at Kenyatta National Hospital/University of Nairobi and on use of High-Flow-Nasal-Cannula respiratory support for children with acute lower respiratory disease at AIC Kijabe Hospital. Both studies were funded by the Seattle Children’s Center for Clinical and Translational Research.